Telula is a juice brand that I was introduced to just a few months ago! With so many juices on the market, it can be tough for a brand to stand out, but with its unique flavors and chic design, Telula has quickly become a crowd favorite. Made from pure, organic, not-from-concentrate fruits and vegetables, the juices are cold-pressed and free of GMOs, pesticides, preservatives, and added sugar. I mean… the sentence just screams healthy! 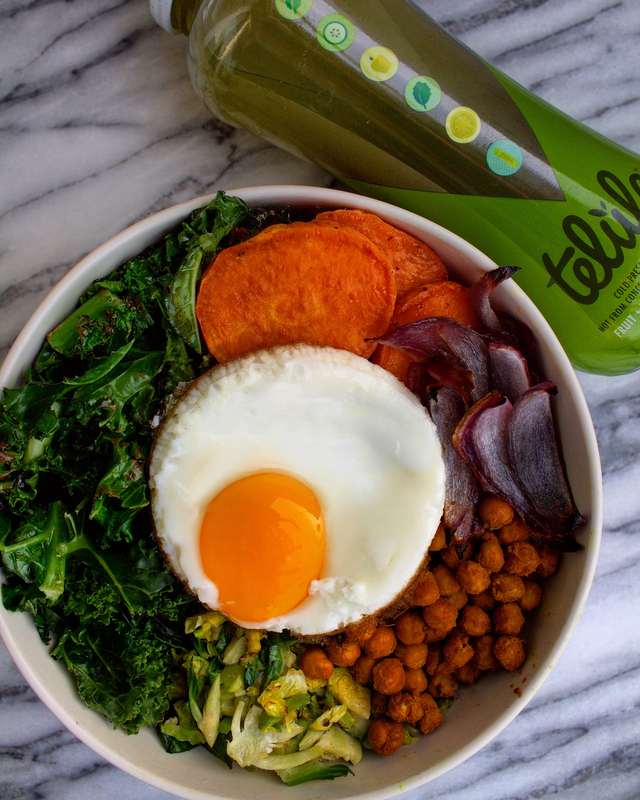 I’ve partnered with TheFeedFeed & Telula to introduce you to my Savory Greens Bowl, complete with Kale, Brussels Sprouts, Sweet Potato, Onion, an Organic Egg, and Tumeric Roasted Chickpeas. This bowl is my go-to for the winter months, as it takes advantage of in-season vegetables and is extra hearty to keep your mind and body warm. Here’s how it’s done! 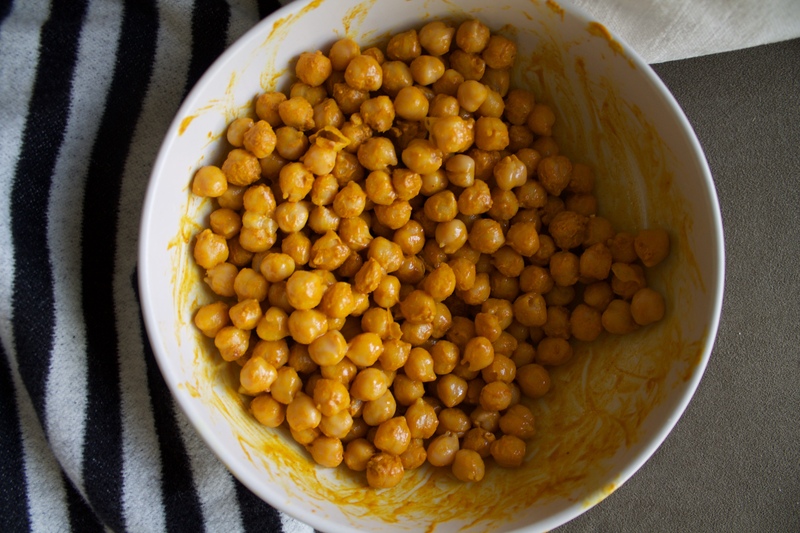 Melt the coconut oil, and add to the bowl of chickpeas. Add the turmeric and salt, and with your hands or a spoon, mix everything together. When chickpeas are totally covered, pour onto a tray lined with parchment paper. Bake chickpeas at 350 degrees F for 45 minutes or until desired crispiness. *If your Brussels sprouts are not shredded, place in a blender and chop to desired level of shred. Add 1 T of Coconut Oil to a skillet at medium heat, and add kale and Brussels sprouts to the skillet. Stir pretty continuously. The kale will start to darken at the ~4-5 minute mark. At this point remove your greens and add to your bowl. Slice a half onion into wedges, and peel/slice your sweet potato. Place on parchment paper, and add 1 T of Coconut Oil and season with salt and pepper. Cook at 350 degrees F for 20 minutes, flip the sweet potato and onion wedges, and cook for another 20 minutes at 400 degrees F.
Top off the bowl with an organic, sunny side up egg and wah-lah! To find Telula near where you live - be sure to visit their site!